"I personally expect that both will offer near-identical picture and sound quality, but if Blu-Ray players and software prove to be worthy of their premium prices you'll read about it right here." So here we are a few months later and Blu-ray has finally launched with its very first player, the Samsung BD-P1000. The unit retails for $999.98, exactly twice as much as the comparable HD DVD player. Was it worth the wait, and more importantly the expense? Sadly, and it really pains me as a High Definition fan to say this, but what we've got is a case of twice the price for less quality. If this first player and the initial wave of discs are any indication, Blu-ray has not only failed to surpass its less-expensive rival, it has quite a bit of catching up to do. In order to justify the higher retail prices, Blu-ray backers have argued several technical advantages in their favor. Chief among these is the format's greater storage capacity of 25 gb per disc layer, which should in theory allow it to store HD video with less compression and hence better quality. They've also criticized the initial Toshiba HD DVD players for being limited to only 1080i HD resolution output while the Blu-ray players brag of their output up to 1080p. The Samsung player comes packaged with a cardboard counter display (we're supposed to set this up in our homes?) that advertises its "Full HD 1080p" output. It then claims this is "better than five times the resolution of standard DVD" - a grandiose way of saying that it's exactly six times DVD resolution (as is HD DVD for that matter). Regarding these technical specifications, although Blu-ray indeed claims theoretically better storage capacity, the reality of that assertion is mitigated by several hugely important factors. First of all, due to their complicated manufacturing needs, the production yield rates for single-layer 25 gb Blu-ray discs have been rather poor, and dual-layer 50 gb discs apparently have such a high failure rate that so far no titles have been released in that configuration. On the other hand, while HD DVD only offers 15 gb capacity per disc layer, the majority of that format's releases have been on dual-layer 30 gb discs. What this means is that, up to this point, HD DVD has in fact offered higher storage capacity. That said, if Blu-ray can get their act together and successfully manufacture 50 gb discs they will regain the edge in the storage race (based purely on raw capacity). Until that happens, you'll have to forgive me for remaining skeptical. Even more importantly than just the capacity itself, however, is the issue of how data is stored within that space. HD DVDs have been using Microsoft's VC-1 codec, an advanced compression format capable of squeezing huge amounts of high-resolution video into a limited storage space without visible artifacts. VC-1 doesn't need 50 gb for movie storage; it's proven that even longer movies can fit perfectly well within 30 gb and maintain excellent quality while still including numerous bonus features on the same disc. The Blu-ray discs released so far have (at Sony's insistence) been using the older and less efficient MPEG2 codec (the same format used on regular DVDs), which requires a lot more space to deliver comparable results. On top of this, many Blu-rays encode their movie soundtracks in uncompressed PCM format that eats up enormous amounts of space, leaving even fewer available bits for the video. The first Blu-ray releases have been mostly shorter movies and have dropped many of the bonus features from their comparable DVD editions to save space. Blu-ray can use VC-1 (or the also-efficient MPEG4), and perhaps will in the future, but I can only judge what has actually been released, and the results so far are decidedly inferior to what HD DVD offers. I made some effort to debunk the 1080i vs. 1080p argument in my HD DVD player review. In short, both 1080i and 1080p utilize the exact same number of pixels: 1920x1080. The only difference between them is that one is delivered in separate interlaced fields while the other is delivered in whole video frames. When a 1080i output signal is transmitted to a 1080p-capable display, that signal will be deinterlaced and will appear on screen in no less than 1080p format. Both HD DVD and Blu-ray natively store their movie content as 1080p video frames, so the act of reassembling the interlaced fields is much easier than if the data had been originally captured and stored in only interlaced format. As proof of this concept, look no further than the Samsung Blu-ray player itself. Although Blu-ray disc data is stored in 1080p format, the Samsung's Broadcom decoder chip (incidentally, the same chip used in Toshiba's HD DVD players!) is limited to output at a maximum of 1080i. In order to live up to their "True HD 1080p" advertising claims, Samsung has added a Faroudja deinterlacing chip downstream of the decoder. So the data on a Blu-ray disc goes from 1080p to 1080i back to 1080p before it leaves the player. Contrast this to an HD DVD signal chain, where the only difference is that the 1080i interlaced fields get reassembled in the display rather than the player. And of course let's not forget that both formats are currently on their first-generation hardware. 1080p output from future players of both formats is almost a foregone conclusion. Let's get right into specifics about the first Blu-ray player now. The BD-P1000 has a shiny black finish that's aesthetically rather pleasing. It's a little smaller and lighter than the Toshiba HD DVD models, and looks more like a regular DVD player than a computer-in-a-box. If a video format could be judged purely on the outward appearance of its hardware, Blu-ray would have an edge. However, it looks a little bit too much like a DVD player, or more specifically like a cheap Samsung DVD player, not like leading-edge new technology worthy of a $999 list price. The HD DVD players at least are big and heavy, and feel like they're giving you something for your money. There is one serious cosmetic problem with the Samsung model, also. When powered on, the Blu-ray logo and two of the front panel buttons light up with a shiny blue glow. It's meant to look sleek and impressive, but can be terribly distracting in a darkened home theater room, especially if the player is positioned below your screen. Although there is a command in the Setup menus to dim the LED display, the blue lights cannot be adjusted or turned off. In any case, this is a superficial complaint at most. It has nothing to do with the player's actual performance. When the second-generation models are ready, both formats will be more streamlined. HD DVD players have been criticized for their slow boot-up and disc loading times. The Samsung Blu-ray player clocks in a little bit faster. It's slow by regular DVD standards, but not slow enough that it will be too distracting. Perhaps more surprising is the player's responsiveness. When turning on functions or transitioning between menu pages, the unit will often display a Windows-style hourglass to let you know that it's processing. Again, it's not so slow that it ever becomes a nuisance, but is a little bit comical. The player behaves more like a computer or video game console than a movie playback deck. I complained previously about the Toshiba HD DVD remote control, yet Samsung's is unfortunately no better. Though it fits in the hand a little more comfortably, the button layout is an absolute mess. Key functions are not positioned where you would think to press for them. The "Play" and "Pause" functions, for instance, are consolidated into a single button. The "Menu" button above the directional arrows doesn't access the disc menus like you'd expect; it's for the player's Setup menu. For disc menus there's not one but two tiny buttons hidden at the bottom. This is a terrible remote. On the subject of disc menus, Blu-ray uses a Java-based interface that allows you to pull up the menus while a movie is still playing. It's pretty much exactly the same as HD DVD's HDi menu option, actually. On the BD-P1000, you have to hit the "Popup Menu" button to get this to work; the regular "Disc Menu" button takes you out of the movie. Unlike HDi, the Popup function will not work when a movie is paused. 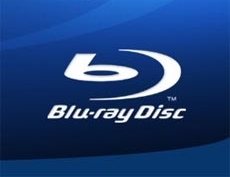 Blu-ray supporters claim that the Java menus will offer a number of other interactive features, and a little booklet that comes with each disc promotes something called Blu-Wizard that will "customize the way you watch special features to provide a unique viewing experience". The booklet instructs you to select "Blu-Wizard" on the disc's main menu, but there was no such option anywhere on the currently available discs that I could find. The only thing close was a tutorial on the Lionsgate discs for how to navigate their menus (they're really not that complicated). I guess Blu-Wizard just isn't ready yet. Also not ready is the internet connection that Blu-ray promoters have been hyping will revolutionize the movie-watching experience by letting you search online for products that you see in the movie (as if that's something anyone has been dying to do). The BD-P1000 has no ethernet cable port, so that's a definite no-go on this model. What we have instead are two flash memory card slots for slide shows from a digital camera. I had neither the ability nor interest to test this out, so I'll just take Samsung at their word that it works. The BD-P1000 has your standard bevy of connection options, exactly the same ones that HD DVD offers. There are useless Composite and S-video outputs, but of course neither can actually transmit High Definition video so there's no cause to ever plug them into anything. High-Def is output by either Component Video or HDMI. Just like HD DVD, the analog Component Video connection is technically capable of outputting full High Definition video, but the player will enforce a resolution-crippling Image Constraint Token if the software manufacturer encodes a disc with one. Thus far, no studios have yet followed through on the threat of that, fortunately. The HDMI output is compliant with HDCP copy protection and must be connected to another HDCP-enabled device to function. The HDCP handshake process is a bit jittery, and on my display the picture awkwardly starts up, blacks out for a few seconds, and then restarts any time you stop or start a disc. This also happens, quite annoyingly, when you navigate from the High Definition menu pages on a Blu-ray disc into any bonus features encoded in Standard Definition. For audio we're given Toslink and digital coaxial S/PDIF outputs, as well as separate 2-channel and 5.1 analog connections. The HDMI connection is also capable of transmitting audio along with video. I'll go into more detail on these audio options below. The Samsung BD-P1000 is backwards compatible with regular DVD (as well as CD, which some Blu-ray players will not be). It can upconvert 480i DVD video to 480p, 720p, or 1080i resolutions. It tested this out a little bit, but my philosophy is that if I want to watch a DVD I'll watch it in a quality DVD player. A Blu-ray player is best served watching Blu-ray discs. However, I realize that some potential buyers will find this more important than I do. The unit is compatible with Region 1 NTSC DVDs. It is not a region-free deck and cannot play PAL discs regardless of region coding. The player will not pillarbox or zoom 4:3 or non-anamorphic letterbox content, so you won't want to watch discs of those types at an upscaled resolution unless you enjoy watching the picture stretched to 16:9. This is also problematic on the Blu-ray discs themselves, which have so far recycled DVD bonus features in 4:3 Standard Definition video without pillarboxing; on most HDTV displays these will come out looking stretched. The BD-P1000 uses a Faroudja DCDi deinterlacing chip that passed most of the important tests on the HQV Benchmark DVD. In this regard, it outperformed the Toshiba HD-A1, which has some difficulty with video-based content. In my testing, both performed about the same when it came to deinterlacing film-based movies. The Samsung's scaling process didn't introduce any distracting artifacts that I noticed, but the resulting picture was not as sharp or detailed as the HD-A1's (many owners have raved about the Toshiba's upscaling abilities). For lack of testing this all that extensively, my preliminary judgement is that the BD-P1000 is a reasonably decent though not exceptional upscaling DVD player. If this were your main criteria for buying it, the unit is certainly not worth $999 for that alone. Better upscaling DVD players can be purchased for significantly less. Let's get right to it: how do Blu-ray discs look? To be blunt, the first couple of discs I watched looked like crap. No, I'm not kidding or exaggerating for effect; they look pretty bad. Among the titles that Sony Pictures Home Entertainment elected to launch the format with are The Fifth Element and House of Flying Daggers, two beautifully photographed movies that ought to make excellent showcases for High Definition video. Fifth Element in particular is often cited as a demonstration quality disc on standard DVD, so you'd expect it to pull the same duty here. Sadly, not so much. I'll go into more specifics in my individual reviews of the discs themselves, but for some reason Fifth Element was mastered from dirty, scratched-up film elements in much worse condition than their older Superbit DVD edition. Both titles, especially Flying Daggers are excessively filtered and compressed. Neither looks anywhere near as good as an average HD DVD release. The decision to encode the movies with MPEG2 compression on single-layer 25 gb discs also cluttered by space-hogging PCM audio has obviously resulted in a serious sacrifice of picture quality. Needless to say, this is a very bad start for the Blu-ray format. The next two discs I watched were The Terminator (from MGM) and Terminator 2 (from Lionsgate). Both were better than the Sony titles (especially T2, which isn't burdened with PCM audio), but they both still exhibit obvious digital compression flaws. The first Terminator I had trouble telling apart from its regular DVD edition, and even T2 looks at best like a mediocre HD DVD. Nothing I've seen so far has risen to the level of the better-class HD DVDs such as The Last Samurai, The Phantom of the Opera, or The Bourne Supremacy, all of which demonstrate nearly artifact-free video with amazing levels of detail and vibrancy. Blu-ray has certainly not put is best foot forward with these first releases. Given that there is currently only one Blu-ray player available, it's hard to pinpoint exactly how much of the disappointing video quality is the result of poor disc mastering and how much is actually the fault of poor decoding by the player, but it's worth noting that the BD-P1000 uses the same Broadcom decoder chip that has produced such excellent results in Toshiba's HD DVD players. Perhaps Blu-ray is more complicated to process or Samsung has not configured the chip correctly (the company isn't exactly known for making high quality DVD players), but if I had to speculate I'd be inclined to place most of the blame on the discs themselves. The technical limitations of these first discs are well known, and many of the problems seen are familiar MPEG2 artifacts the likes of which are found on many poorly-mastered DVDs. More debatable is an issue seen in all of the initial Lionsgate titles that have opted to include regular DTS audio instead of PCM. When you choose the DTS soundtrack, the video becomes noticeably jerky, a problem that goes away if you choose Dolby Digital instead. Until we get a larger representative sample of players from other manufacturers, I can't say whether that's a flaw in the Samsung BD-P1000 or the disc, but there's a good chance it's the player. I tested the BD-P1000 over both HDMI and Component Video. In order to switch between these, you have to push a button on the player's front panel; there's no option to change output by the remote. I've read some user comments that claimed Component Video was superior to HDMI on this player, but I don't share that experience. In my testing, HDMI was visibly sharper and provided more saturated colors at both 720p and 1080i resolutions. Even after careful independent calibration of each output, the difference was far from subtle. I'm not able to test 1080p output at this time, so I suppose it's possible that there's an error in the 1080p processing that further degrades the HDMI video, but I can't confirm that. From what I've seen so far, HDMI is definitely the better option. The player will output High Definition video at your choice of 720p, 1080i, or 1080p resolutions. 1080p is only available over HDMI, and is only enabled if the startup handshake between your components confirms 1080p compatibility in the display; otherwise that selection is grayed out in the setup menus. As I mentioned earlier, 1080p from this player is produced by decoding the original 1080p disc data to 1080i and then deinterlacing it later to reassemble the 1080p frames. It's a roundabout process to get right back where they should have started, but at least in theory it should be relatively easy to perform losslessly. How well Samsung's implementation follows through on this promise I can't yet validate, unfortunately. Under normal circumstances I'd advise setting the player's output to match the native resolution of your HDTV display, but when I directly compared several Blu-ray movie scenes at both 720p and 1080i output on a native 720p projector, the 720p option was noticeably softer in fine object details. The scaling process to 720p seems to be flawed. The Toshiba HD DVD players have a similar issue (theirs involves jagged scaling artifacts rather than softening). For both formats, I recommend 1080i output from the player regardless of your HDTV display type. Here's where things get really messy. The HD video revolution has brought with it the potential for several new high-resolution audio formats including high bit-rate Dolby Digital Plus or lossless Dolby TrueHD and DTS-HD Master Audio. HD DVD has embraced DD+ as its mandatory base-level standard, while offering limited support for TrueHD (only 2-channel decoding) and DTS-HD (downconverted to standard DTS) in the current hardware. It's a good start, with obvious room for improvement in the second-generation players. Blu-ray meanwhile allows all of these same audio formats as optional additions, but does not require any of them in the hardware or software. Regular Dolby Digital and DTS are the only mandatory audio standards. Unfortunately, all of the first-generation players, including this Samsung BD-P1000 and the upcoming models from Sony, Pioneer, and Panasonic, do not support any of these new audio formats at all. The players have no decoding circuitry, and no ability to transmit the bitstreams to external A/V receivers for processing either (for that you'll need an HDMI 1.3 connection, but only HDMI 1.1 is currently available). As far as Blu-ray is concerned at this point in time, DD+, TrueHD, and DTS-HD MA are out of the question. HD DVD's support may be limited, but Blu-ray's is nonexistent. So what do we have? Well, of course there's normal Dolby Digital and DTS, so at a minimum Blu-ray will offer the same audio quality as traditional DVD, without improvement. These can be transmitted by the Toslink or coaxial connections as well as HDMI. Although the player also has 5.1 analog outputs, its internal Dolby Digital decoder is limited to 2 channels and it doesn't have a DTS decoder at all. If you want surround sound, you won't be using the analog connections with DD or DTS soundtracks. You're probably wondering what the 5.1 analog outputs are good for, then. Because Blu-ray isn't ready to step up to the plate with any of the new audio formats, Sony has decided for its software releases that the next best solution is to provide the soundtrack in PCM 5.1 format. PCM is uncompressed and therefore should offer very high audio quality. The downside, as I mentioned earlier, is that an uncompressed soundtrack swallows up a huge chunk of the disc's bit budget that could be used to improve video quality instead. With the limited space on 25 gb single-layer discs and MPEG2 compression, it becomes a matter of priorities. Do you sacrifice picture quality for sound? For the first wave of Blu-ray releases, Sony's answer has been yes. Discs from Lionsgate, on the other hand, have foregone PCM in favor of standard DD and DTS, with some visible benefit to the video. When you do want to listen to a PCM soundtrack, your connection options are HDMI to a compatible receiver or 5.1 analog (PCM requires too much bandwidth for a Toslink or coaxial connection, and will be downconverted to 2 channels if you try to use those options). For multi-channel analog, the BD-P1000 has some serious limitations. While the player will allow you to set your speaker types to Large or Small, it has no ability to adjust speaker distances or volumes. Test tones are nonetheless available anyway, but Samsung programmed them incorrectly so that the tones come from the wrong speakers. And since the player has no internal DD 5.1 or DTS decoders for the analog outputs, you can't use a DVD calibration disc either. It is therefore impossible to calibrate your audio when using the analog outputs. I'm not sure what type of DACs Samsung has built into the unit, but the PCM tracks I've listened to so far have been a little bright and harsh in comparison to standard Dolby Digital or DTS decoded by my receiver. On the other side of the format war, HD DVDs have chosen to maximize their video quality with VC-1 compression and still get a lot of bang-for-the-buck with Dolby Digital Plus audio (some discs are also already encoded with the losslessly-compressed Dolby TrueHD 5.1, which offers audio transparent to the studio master without compromising the video quality by taking up as much space as uncompressed PCM). For half of the BD-P1000's list price, the $499 Toshiba HD-A1 has high quality SHARC DACs, full support for DD+ (and now TrueHD 5.1 as well), and all of the setup options you'll need to calibrate its 5.1 analog outputs. There's really no comparison here. For a $999 player, the audio capabilities of the Samsung BD-P1000 are really just shameful. Make no mistake, the Blu-ray format launch has been truly unimpressive. The $999 Samsung BD-P1000 has fewer features and lesser quality than its HD DVD competition at half the price. The first wave of software releases are also decidedly inferior to those on the other format. Even as a big High Definition fan, I cannot recommend this player for purchase. It is simply not worthy of the large investment. I've tried to give it the benefit of the doubt by putting the player and discs through their paces, but my judgement is clear. In terms of quality, Blu-ray has lost this first battle in the format war. Is it down for the count? I doubt it. The format is still backed by a larger selection of manufacturers and movie studios, at least at this time. Support may change in the future if one side goes under (witness Fox and Disney's migration to DVD after the competing DIVX format from Circuit City floundered back in 1999), but I suspect that this format war will drag on for a while before a decisive victor is declared. In order to survive, Blu-ray needs to both dramatically decrease its hardware costs and dramatically improve its software quality. Consistent production and usage of dual-layer 50 gb discs (assuming that's possible) will be a step in the right direction, but even more importantly the format sponsors need to dump the antiquated MPEG2 compression for a better codec. Players and discs should also start offering support for Dolby Digital Plus, Dolby TrueHD, and DTS-HD Master Audio as soon as possible. Blu-ray backers have been shouting from the rooftops about their format's great potential, but the reality has not lived up to the hype. If that changes in the future, we're certainly prepared to re-evaluate the situation at that time, but as things stand right now Blu-ray is a bust.